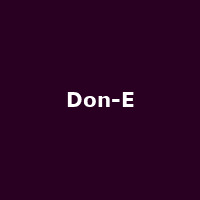 Don-E is British soul singer, songwriter, musician and producer Donald McLean from Brixton whose career began in the '90s. He had a top 20 hit with the single "Love Makes The World Go Round", taken from his eponymous debut-album released in 1992. Other releases include "Changing Seasons" (1995), "Try This" (2005), "Natural" (2008), "Ladies Night Part 1" (2012) and "Little Star" (2013).